The box office continues its loading up process for the Thanksgiving Weekend mini-bonanza with the second of our big superhero team-ups for the month, though it's clearly the lesser of the bunch despite its pedigree. It's amazing that we've gotten here, but such as it is, the world for DC Films as it has attempted to duplicate the success of the Marvel Universe has gotten us to a very dismal place where this weekend's Justice League – which to be sure, will still make gobs and gobs of money – is basically one of those “well, we committed to the bit, so we've got to go through with it” things, thanks to the doom and gloom of Batman v. Superman. We've got at least the germ of an idea here, with the Baffman putting together a Superhero team to take down an even larger foe than Doomsday – who DC is basically hiding from us since you're never really heard of him – rounding up the aforementioned Aquaman (Jason Momoa, playing him as a combination of a surfer and James Hetfield), The Flash (Ezra Miller), Cyborg (newcomer Ray Fisher) and Wonder Woman, who it turns out is really the only justification for this film existing now. After Gal Gadot blew open the doors for female led superheros with $412 million domestic and close to a billion internationally, she's really DC's lead property, a development similar to how Iron Man suddenly became Marvel's go to character for a bit. The problem comes in how DC and WB have handled all the non-Wonder Woman films to date, which have been unnecessarily grim and quite the slog, especially the lead in film to this, BvS. 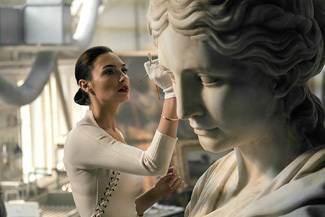 Humor has at least entered the picture, so that's something, but looking at the $103 million opening of Wonder Woman and the fact that it was a fairly leggy film, we may be faced with the idea that the non-Wonder Woman parts of this film are a net *subtraction* from what a Wonder Woman sequel would do. Reviews are fairly terrible with most of the positive ones saying essentially, “hey, it's a movie with all the big DC people *and* more Wonder Woman, what else do you want?” Ultimately this all comes down to a terrible vision for the DC films and the far more pessimistic nature of their heroes to begin with. It's not a coincidence that Marvel's had success with wacky, and that DC's best hit of this generation of films was also their funniest (if not entirely “funny”). Some of the marketing has been... not bad?, maybe, and that poster that's done like an Alex Ross painting is pretty sweet to be honest, but that doesn't really make for a good film. The presence of all of the above heroes does guarantee some measure of success, but it's likely not the amount that WB was thinking of when they started this whole process. I'd look for an opening weekend of about $117 million. While very much not *the* animated film for the holidays, The Star has a laser focus on it target market. It's a heavily Christian telling of the nativity story told from the animals point of view, and a heavy dose of physical comedy and bathroom jokes. With a voice cast that includes Stephen Yuen, Keegan Michael-Key, Anthony Anderson, Kristin Chenowith, Mariah Carey, Tracy Morgan, Tyler Perry... look I'll just cut to the chase here, and Oprah, it's quite the star studded cast – but the tone is just... odd here. It's pitched at a very young audience thanks to this, and will likely struggle to crack out of the ultra-religious and/or tween set. There's a paucity of reviews to date, though they're generally positive, but I have to think they're grading on a curve here based on the modestly animated footage, which consists of pratfalls for about 90% of what they're offering us. Still, points for topicality. I'd look for an opening weekend of about $13 million. A family film of a different sort, Wonder is a surprisingly high-powered film about a child with a facial disfigurement going to school for the first time. Starring Jacob Tremblay of Room as the child, and Julia Roberts and Owen Wilson as his parents, it's the version of Mask this generation apparently deserves. Ironically enough for a movie that's about looking beyond appearances, there's really nothing to this film other than what it appears to be, though it apparently avoids being a treacly mess. If you are looking for the kind of film where Lessons Are Learned, this is very definitely the one for you. It's odd to see stars of Roberts and Wilson's calibre in this, but this feels more like a case where this film wouldn't exist at all without them, as opposed to turning a small film into a tentpole. I'd expect more in the area of $11 million here. Thor: Ragnarok will move out of the way after two weeks on the top of the chart, but having already earned $225 million. An early projection would get this to about $375 million domestic, easily the best of the Thor movies and probably puts it as the sixth best MCU film of all time in terms of earnings (ahead of this year's Spider-Man: Homecoming). Ordinarily you'd think direct competition in genre would hurt, but I feel like Thor doesn't even blink at this one and has a fairly normal drop to $29 million. Daddy's Home 2 and Murder on the Orient Express battled to a near draw with about $29 million each, with the drama having a bit of the edge this weekend. Both overachieved a bit, though, and have solid chances to run strong through the first part of the holidays. I'd give Orient about $17 million, with the Ferrell/Wahlberg comedy hitting $15 million. Bad Moms Christmas will hang around for one more week with around $6 million, though it's going to well underperform the $115 million of the original.